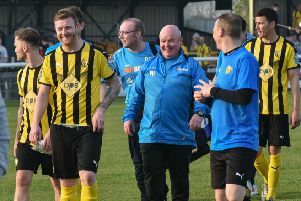 Leamington boss Paul Holleran was able to enjoy the final days of his holiday safe in the knowledge that his side for the opening-day clash with Altrincham was if not quite inked in, at least written in very firm pencil. Holleran left Martyn Naylor to oversee the final two games of pre-season while he took a family break in Ireland. A defeat to Birmingham City Under-23s and a 2-1 win over Bromsgrove Sporting offered little in the way of pointers to the starting line-up at the J Davidson Stadium tomorrow as holiday commitments continued to bite. However, Holleran was unconcerned, admitting a busy summer of recruitment would not massively change the DNA of the team which finished the last term with a flourish. “There are a couple of positions that are very close but we’ll need that squad depth with the amount of games we’ve got in such a short space of time,” said Holleran. “As much as you try to build up in pre-season, not a tackle goes in. “It’s about getting the preparation right because at 3pm on Saturday when it’s all for real, the tempo of the game is different and you hope the players are tuned in. “What will stand us in good stead, though, is that we are a very similar shape to last year. Brakes had to wait until the penultimate game of last season to guarantee their survival, with Matt Dodd heading home a Liam Canavan cross to spark scenes of delight at York. And, while both players have since left the Phillips 66 Community Stadium, Holleran believes the struggles of last season will be a huge benefit for the remainder of his squad as they look to avoid the second-season syndrome. “We’ve got the experience of last year but everyone in the division is upping their game. “We’ll look to improve on last year and if we break the 50-point mark that will stand us in good stead. “But realistically the sides that are full-time will be at the top end of the table and there are some big part-time sides with resources and big squads. “Then there’s another group and we need to push on. Last time (we were in this division) we stuttered and went backwards. “It’s not going to be massive strides, not unless someone magics £500,000 down from the sky. Brakes open their campaign at Northern Premier League champions Altrincham tomorrow and Holleran says his side cannot afford to repeat the mistakes of last season which saw them take just three points from their opening seven games. “Altrincham have got the momentum, they’re a big club. “They went from a mid-table Conference Premier side to the Northern Premier in the space of two-and-a-half years but now they’ve stopped the slide and they are resurgent. “They’ve added a little bit of quality and they play good football. It’s a great place to go, it’s got a great surface and the momentum is with them. “But we have experience of this league and we know what we have to do to pick up points away from home. “First of all though, we have to hit the ground running and the first step is that we have to start better than last year.